When a tooth is damaged and the possibility of restoring it virtually impossible, the entire tooth is extracted and an implant is placed in place of the root of the extracted tooth. Then the implant is restored with a crown. Dental implants are usually made with titanium which is a biocompatible material. There are several types of implants which are used according to the type of existing bone.They differ by the type of form and thread design. There are also different types of length or width depending of the amount of bone into which the implant is placed. The choice of implant depends on many factors: the amount of existing bone, the location of the missing tooth, etc…which is to be decided by the surgeon. How are these crowns attached to implants? Crowns can be attached to implants by internal or external hex. Implants are placed during a surgical procedure. Such a procedure is performed under local anesthesia and the duration of the procedure is relative to the number of implants to be installed. However, it usually lasts from 30-40 minutes per implant. What happens after the implant is placed? After surgery, the patient is left with either a temporary crown or just a healing cap. The process of osseo-integration takes from 3 months to 6 months. This is the process in which the implant joins the bone through fibers generated from the bone. When this osseio-integration is done, the implant is stable and can resist almost the same force as a natural tooth. Then, the permanent crown will be placed. Dental veneers are thin layers of restorative materials that are bonded to the front of teeth to improve the appearance of your smile. When done correctly, veneers can change the contour, color and dimension of your teeth. The process of placing a veneer involves removing some of the enamel from your tooth using local anesthetics. This procedure is irreversible since tooth structures are removed. If you are considering veneers for aesthetic purposes, it is important to evaluate other options, including orthodontics and teeth whitening. At West Gray Dental, Dr. Ho can help you make the right decision concerning your needs. At West Gray Dental, we offer two types of veneers, direct composite veneers and laboratory-made porcelain veneers. Composite veneers (sometimes referred to as direct resin or composite bonding) are the less expensive and can be placed with one visit. There is also a wide variety of shades available to best match your adjacent teeth. Unfortunately, composite veneers do not last as long as porcelain ones and they are less resistant to stains caused by extrinsic factors such as tobacco, coffee, red wine, blueberries, etc. Laboratory-made porcelain veneers offer greater durability and a wide variety of shades but they require two visits. During the first visit, after the preparation is done, an impression is taken and a temporary veneer is placed. A few days later, the patient returns to have the permanent veneer placed. Crowns are used to protect teeth when a tooth is damaged and has lost more than 50% of its surface, resulting from fractures, tooth decay and even a simple filling that is too large. A dental crown is a prosthesis that “caps” the affected tooth. A devitalized tooth – a tooth that has undergo a root canal treatment is often brittle and prone to fracture. Such devitalized tooth can also be discolored. To resore a tooth that is fractured or broken due to decay, trauma or bruxism. Resin – These are more economical but over time they can easily break or worn down. Ceramic or porcelain – These are very similar to the natural color of teeth and are more resistant. material specified by Dr. Ho. Once a permanent tooth is extracted for whatever reason, it is important to replace it with an artificial tooth as soon as possible. This prevents your other teeth from shifting out of alignment, while also protecting your teeth from other problems in the future. A bridge (also called a “fixed bridge”) can be used to replace one or even sometimes two missing teeth. It generally consists of one artificial tooth permanently affixed between two real, healthy teeth. The two teeth on either side of the missing tooth are prepared to be fitted with crowns. Impression is made of the preparation. The replacement tooth and two crowns are fabricated in a laboratory as one piece. The dentist permanently affixes the bridge to the adjacent teeth using cement. If well taken care of, a bridge should last you ten years. Dr. Ho will show you how to keep your bridge clean using dental floss and/or floss threaders. The removable dental prosthesis is required when there are missing teeth which cannot be replaced by implants or bridges for physiological or mechanical reasons. Removable partials and dentures can replace the teeth permanently or temporarily. Sometimes, dentures can also be supported by implants for better retention. If the pulp or nerves of a tooth are damaged or becomes infected due to trauma or carious lesions, your dentist will have to intervene with a procedure called root canal therapy. This is when the affected pulpal tissues are removed, the root canals are disinfected and filled with a permanent filling. This procedure allows you to preserve your tooth. Most of the time, teeth can be saved by doing a root canal therapy, but there are some instances when a tooth will have to be extracted. Dr. Ho has extensive experience with these procedures and will gladly discuss the options which is best for you. After giving you a local anaesthetic, the dentist drills a small opening on the top of the tooth to reach the pulp and root canal system. The dentist then meticulously cleans out the pulp tissues and fills the now empty root space with a rubber-like material that will be melted to bond with the tooth. Finally, the dentist seals the opening with either a temporary or permanent filling to make your tooth look as natural as possible. Usually a crown is placed after a root canal therapy to protect the tooth from breaking. Although a root canal can be performed in one appointment, it may take several visits depending on the degree of pulpal damage or spread of infection. Also, after the treatment, you will probably experience tenderness in and around the tooth. Dr. Ho is there to walk you through the different steps so don’t be afraid to ask questions! Gingivitis is an inflammation of the gums caused by an accumulation of plaque and tartar. Left untreated, it may progress to periodontitis with possible tooth loss due to destruction of the hard and soft tissues that surround your teeth. Red, inflamed gums that are sensitive to the touch. Deficient immune system that can result from a malfunctioning thyroid gland, diabetes, pregnancy or leukemia. Bad habits, such as biting your nails, clenching or grinding your teeth, smoking, consuming too much sugar or eating poorly. Taking certain medications, including hormonal contraceptives and drugs. Gingivitis is reversible. It is important to treat gingivitis quickly before it turns into periodontitis because the bone that supports the teeth can deteriorate, putting them at risk. Pregnancy gingivitis is usually only temporary, caused by hormonal changes. Everything will return to normal after you give birth. Do you think you might have gingivitis? Consult us without delay. Our experienced team will make a diagnosis and give you the right advice that applies to your situation. Bad breath (halitosis) affects approximately 75% of the population. It is found that halitosis has an oral origin. Gum diseases, smoking as well as inadequate oral hygiene are responsible for close to 60% of oral factors, and the tongue is responsible for about 40%. In some instances, reduced saliva flow due to medications can cause halitosis as well. It is important to maintain good oral hygiene with regular teeth and tongue brushing. If your bad breath persists with regular teeth and tongue brushing, it may be caused by some systemic problem. Consult us at West Gray Dental and Dr. Ho can point you to the right direction in solving your bad breath problems. Bruxism is the unconscious grinding or clenching of teeth that occurs mostly at night and may or may not associated with episodes of jaw locking. Not much is known yet about this condition but in many cases, anxiety seems to be the main cause. Some of the symptoms consist of wear facets on teeth, broken fillings, headaches and pain or soreness in the cheek and jaw joint areas. If you think you have bruxism, consult us. We may be able to fabricate mouthguards that will keep your teeth from grinding against each other. The mouthguard protects teeth and nearby structures such as bones, jaws and soft tissues. It is used in contact sports but also in activities where there is the risk of a fall. The prefabricated mouthguards are less expensive but they offer limited protection found over the counter at pharmacies. For optimal results, it is best to use custom-made mouthguards adapted to your mouth and to your activity. They cost more but the investment is worth it in terms of comfort and protection. Some insurance plans cover mouthguards made by dentists. While you are sleeping, the muscles in your throat that keep the airway open relax and decrease the diameter of the opening. This causes the surrounding structures to vibrate and snoring occurs. Excessive fatty tissue in overweight patients. Snoring is an often benign condition that inconveniences the snorer’s sleeping partner more than anyone else. However, it can also be symptomatic of a much more serious condition: obstructive sleep apnea, a medical condition that affects 2% of women and 4% of men between the ages of 30 and 60. Diagnosis must be made by a specialist, usually a pneumologist specializing in sleep disorders. Is your snoring a problem? Consult us and our team will give you the appropriate information and refer you to a specialist if needed. 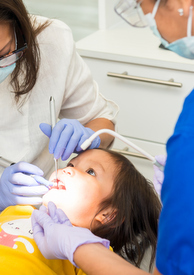 Dental sealants are used as a preventative measure. They can prevent the formation of tooth decay or cavities in the natural fissures of your premolars and permanent molars. However, they do not replace brushing your teeth, flossing, eating well and visiting your dentist. This treatment does not require local anaesthesia, so no needles are involved. It is also very quick, requiring only a few minutes per tooth. Some parents consider dental sealants for their kids to prevent or at least delay the infamous drill. However adults can benefit from dental sealants as well! use Opalescence 35% in bleaching trays. It is necessary to note that during the bleaching process, the patient should not be exposed to substances that stain teeth, such as smoking, tea, coffee, drinks and colorful food since it will not have optimal results. It is likely that during treatment and even after this, the patient may experience teeth sensitivity Dr. Kim Ho at West Gray Dental will guide you through the treatment. WG Dental is proud to provide dental care to patients living in Houston Montrose, Downtown, Neartown, Midtown, 77019 / 77006 zip codes and surrounding areas.